Late season wildflowers on the slopes of Mt. Ashland. 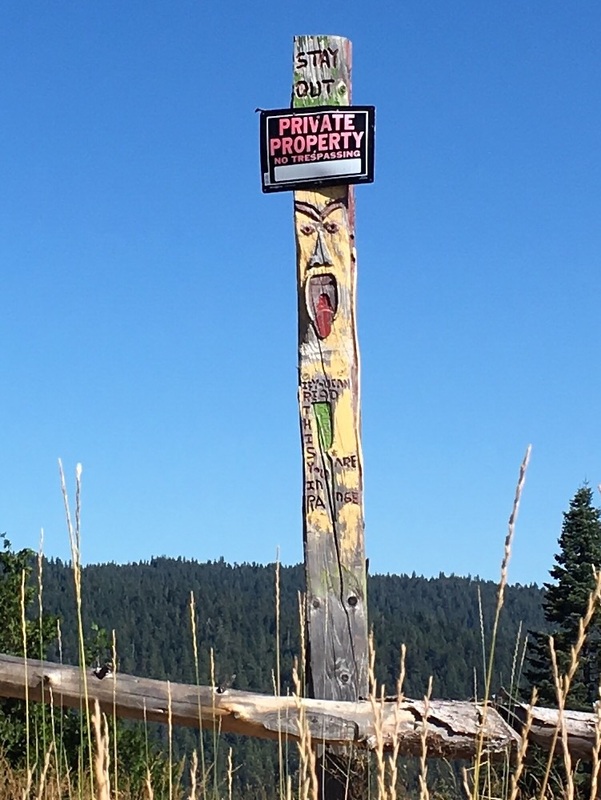 We've seen a number of "private property" signs along the PCT. This was the most creative so far. We returned to the trail and started our climb up towards Mt. Ashland. We started in mixed forest, and after several miles we were walking through alternating conifer forest and alpine meadows. Since we started our hike 7 weeks ago, we have seen the transition from lingering snow through early summer to late summer/early autumn in the wildflowers and plants along our path. In parts of WA the corn lilies were just emerging from the snow, and within a few weeks they were only a foot or so tall. Then they were 3-5' tall, then in bloom, and now they are yellowing and gone to seed. Lupine is another plant we have seen everywhere along the trail and now they are mostly done blooming and instead have developed their seed pods. The paintbrush are just the same. While we were admiring this scenic transition over a snack break, we were surprised to see a hiker coming along southbound. We met Huck, who had hiked OR and WA NOBO and just returned to Ashland to start the rest of her hike as a SOBO. For us, it would be quite jarring to be in northern WA one day and then a few days later jump into The dramatically different scenery and weather of southern OR. However, to each their own - HYOH. Buckwheat and other wildflowers blanket the meadows. Granite and manzanita almost feel we're back home. After Mt. Ashland the trail continued to traverse just below the ridgeline and we crossed several very narrow saddles or gaps. The slopes were a combination of decomposed granite and sandy soil giving everything a beige tone. 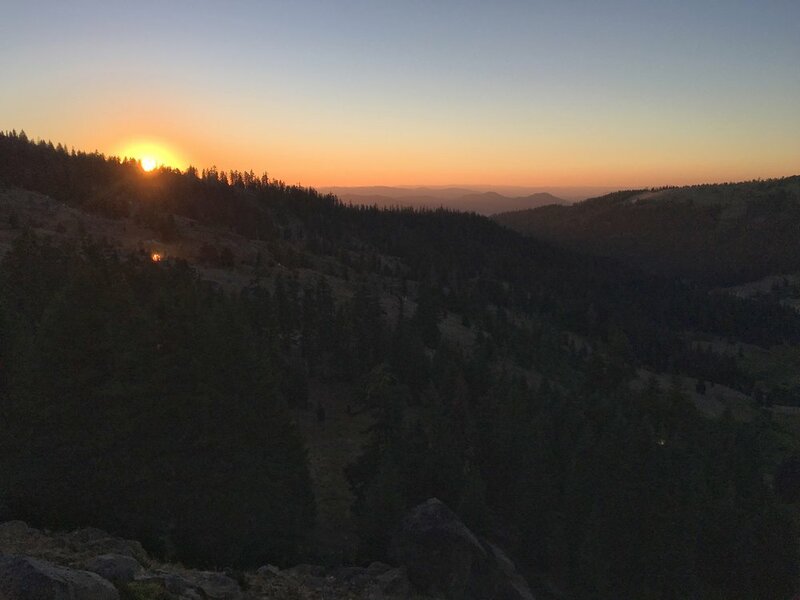 The landscape alternated between dry forest, open expanses of manzanitas and wildflowers (especially buckwheat, varying in hue from lemon yellow to a deep orange-red), and dry grassy meadows. The miles ticked along and we passed several named gaps: Grouse, Siskiyou, and Wrangler. At one of those gaps, the trail passed a small copse of trees and there were two coolers labeled trail magic. I can say that warmish soda has not tasted that good in a long time (if ever). Further along this hot, exposed, and unending though scenic traverse, we could hear the clanging of cowbells. After looking around for a while, we spotted cows way down in the valley below. First telltale sign of a fire, black smoke rising from the ridgeline. Same ridgeline 3 hours later and a much larger plume. In the mid-afternoon, I was looking out towards Mt. 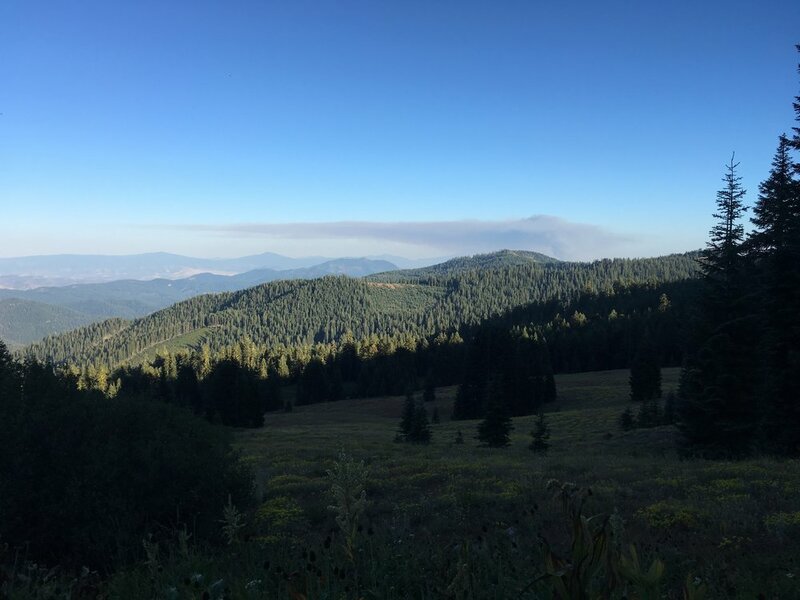 Shasta and noticed a small plume of dark brown smoke rising from behind a ridge. As the afternoon progressed, the plume got thicker and became more grey as it formed a dense cloud. By early evening there was a significant amount of smoke stretching out across the horizon and blocking our view of Mt. Shasta entirely. By that time we noticed some aircraft activity and within another 30 minutes there wasn't any new smoke. This was the first fire we've seen during our hike and are glad that it seemed to be a small one. Our post dinner miles were rewarded with a wonderful sunset. Huckleberry writing her journal against surrounded by trees and stars. Several times during the this trip we have stopped to make dinner, then continue to hike a few more miles before pitching our tent for the night. Most often, we've ended up having to hike at least some of that remaining distance by headlamp. On night 50, we finally seemed to have gotten this strategy figured out. Our first night out form Ashland, we stopped for dinner at a great water source, a cold and fast flowing piped spring and then headed onward for another 2.5 miles of hiking into a gorgeous sunset over west facing ridges until we reached a small plateau on the shoulder of Observation Peak as dusk fell. 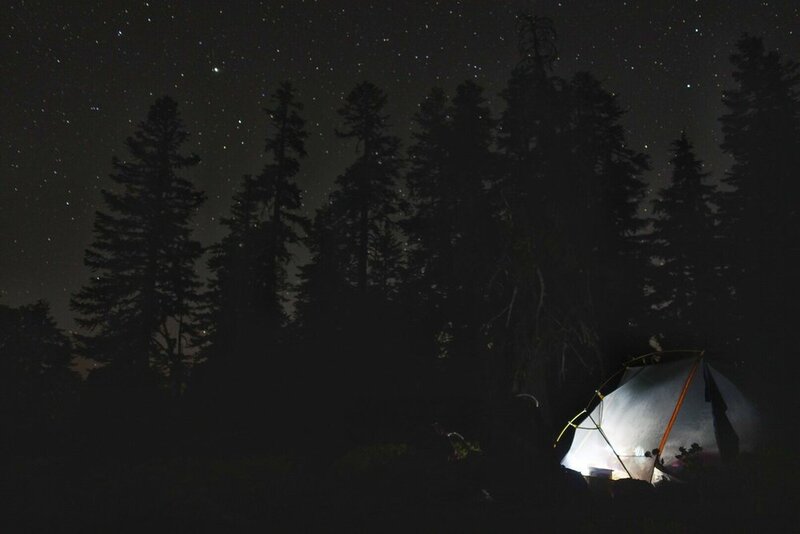 We found a wonderful dry campsite there and set up the tent by headlamp. With no meal or other evening chores remaining, we were able to get to bed just after hiker midnight. Our reward was a multitude of stars above us as the moon would not rise for several hours. It was stunning to look up and see so many of them. I would say that it was one of our clearest nights yet. Welcome home! We're happy to be in California. Feels so good to back. The next morning, Day 51, we finally crossed the Oregon/California border. We had skirted it since rounding Pilot Rock coming into Ashland, and walked due west for several miles just north of the border yesterday, so it was good to finally cross into California. Although the immediate topography, flora, and fauna have not changed, Huckleberry and I felt a certain joy of being back in our home state. Our journey started 7 weeks ago, of which we spent 4 weeks hiking across WA and 3 weeks for OR. We will now be in CA for the remainder of our trek. It's both a homecoming, and a realization of just how big CA really is. There was a trail register at the border crossing, and after the obligatory photos, we signed in and checked for familiar names. We saw that Beanstalk had signed in just 3 days before us, and didn't recognize anyone else. The number of hikers signing the book each day was fairly low, just as the number of NOBOs we are seeing on-trail has diminished dramatically. We saw 20 on Day 50 out of Ashland and will only see only 8 in total today. Like yesterday afternoon, we heard cowbells clanging as we hiked and this time the cows were much closer. Although we've crossed heaps of dirt roads in the past two days, we still wondered how easy it was to round up these cattle when desired. The region is enormous, appears completely unfenced, and has rugged terrain with varied but sometimes quite dense vegetation. It seems that herding cattle by any means would be difficult. Then again, maybe it is easier than we think and perhaps this is why we are not in the cattle business. Anyhow, we startled a few of the closer cows and there was much more intense clanging that soon receded into the distance down the heavily forested slope. Amazing colors in all the exposed rock. We were marveling at it all day. There were these amazing veins of quartz all throughout the rock here. We have been struck by the stark beauty of the landscape in far southern OR and northern CA. 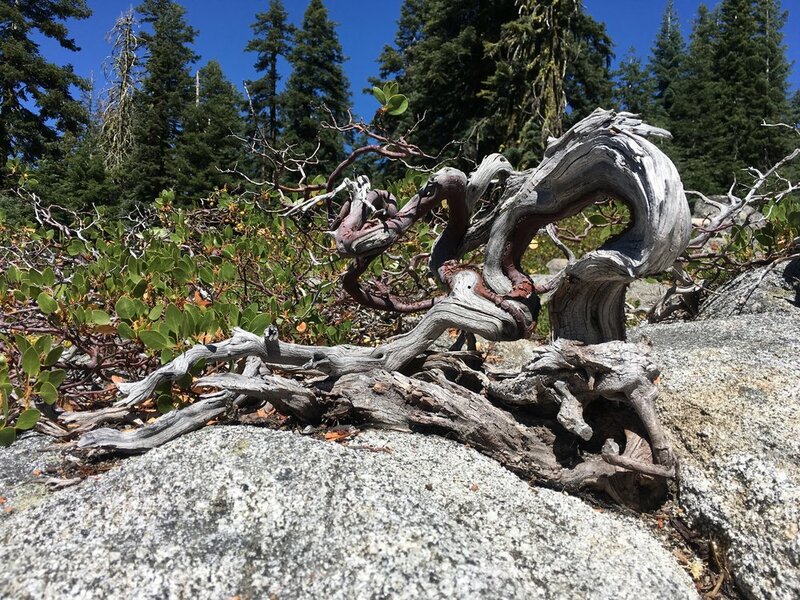 At first, it did feel a little like being at home on the coastal range as the slopes covered in dry grasses, small manzanitas and scattered pines and firs had a familiar feel. I half-expected to come around a corner and see the Pacific out in the distance. However, I reminded myself that we are over 100 miles from the coast and this will not occur anywhere along the trail. Regardless the similarity in flora feels very welcoming. We saw and smelled our first Jeffrey Pines, a familiar favorite in the Sierra Nevada but the first time I've personally seen them outside of that range. Additionally, there is more variation in the rock outcroppings on the ridges and along the trail than we have seen since Chickamin Ridge in WA. There were greys, beiges, greens, and huge veins of white quartz. Some of the greys had a fine metallic sheen, in fact later in the day when I was rinsing my feet off it looked like they had been rubbed in graphite. The combination of rock formations, mixture of meadow and forest, long ridgeline views, and deep blue sky was quite dramatic. Sure it was very hot and dry. Would I choose to spend a weeklong backpacking trip here? Not likely. However, seeing it as part of a larger trip is fascinating and it is part of the gradual transition between regions that you only get to see on something like a thru-hike. Plus, in the distance Mt. Shasta was keeping an ever-watchful eye on us. A NOBO section hiker we had seen by the coolers filled with soda had commented that she'd started at Seiad Valley and the hike had not been all that impressed by the scenery since then, but I'd have disagree with her. Dry terrain may be an acquired taste, but it has high drama and since moving to CA I've cultivated my eye for it and have really loved this stretch so far. In the middle of the day, we heard a commotion in the rock field above us. I went back a few feet and saw an immature black bear scramble back to the top of the ridge about 20-30' above me. I turned around and kept hiking forward telling Huckleberry we shouldn't hang around in case any of his rellies were around. Although he was bigger than a cub, I did not want to chance an encounter with his mum. Otherwise our interactions with CA wildlife have been avidly tame. We saw a rabbit at the border, there are heaps of ground squirrels, Stellar Jays abound, and we've seen some Red-tailed Hawks enjoying the thermals above the ridges. All in all, its good to be home. We've hiked almost 1000 miles, but are not even halfway yet and there is so much left to go. Kangaroo Mountain glowing in the early morning light. Huckleberry outside the Seiad Store, PO and Café. Day 52 started with the morning sun bathing Kangaroo Mountain in warm glowing light. The hike up over the shoulder the peak was gorgeous in the early light and we then started to drop down towards Seiad Valley, just 10 miles from our campsite. After traveling back and forth over a few ridges, we started the long, steep descent down Devils Peak. We saw a small but steady stream of NOBOs, half who had camped on the ridge last night and the second bunch having left town that morning. In total we saw 13, and agreed that the increase in number was the "town effect". We made the 0.8 mile walk along the road to reach the very small town along the Klamath River and found another 8 NOBOs at the cafe. They were all encouraging two hikers who had ordered the pancake challenge, a total of 5 lbs of pancakes to be eaten in 2 hours. Neither of them were able to eat more than two. I asked our waitress, who reported that this year 2 hikers have completed the challenge and in the entire 8 years that she has been involved, only 4 have completed it. Wisely, Huckleberry and I settled on some fresh cut curly fries and thick, tall, delicious milkshakes. Injury update: my ankle turned out to be bruised only and is more or less back to it's happier self, much to my relief. Best Fresh Meal- we bookended our time in OR with grocery store resupplies and made the same dinner for our first and last nights in the state, deconstructed lasagna. By the Numbers: We started OR on Day 31 from Cascade Locks, and camped 1.9 miles from the CA border on Day 50. It took us just shy of 3 weeks to hike 442 PCT and alt route miles across Oregon, along with a handful of bonus miles. We walked through 10 distinct wilderness areas and one national park during this time. We took our first day off of the trip, a zero on Day 49 in Ashland at the home of friends. Excluding that zero, our median daily hiking distance was 25.1 miles. Our longest was Day 42, when we hiked 34.1 miles from Shelter Cove Resort to Maidu Lake. Our shortest was Day 33, when we neroed into Timberline Lodge in 9.3 miles. We also neroed into Bend, and took a lovely wilderness nero below Mt. Thielsen. We slept indoors 4 nights, tentless for 3, and only used the fly twice (once for rain, once for threat of rain). Our highest elevation campsite was Night 45 on the shoulder of Devils Peak in Sky Lakes Wilderness (6756'), and our lowest was Night 34 on the shores of Timothy Lake (3246'). We spent 9 nights above 5500', and only two below 4000'.